Having spent countless hours cranking on industrial quality french fry cutters in commercial restaurants, I would love to say good things about this lightweight home version, the Chefs French Fry Cutter. I can't. The handles are weak stamped stainless steel, the bearings and slides are plain metal on metal fittings and prone to jamming, and pressing an entire potato through the cutter grid without damaging the machine itself is an unreasonable expectation. If you do intend to try it, don't overstress the handles. If you feel the machine jam, stop right there and find out what's wrong, because ordinary human weight and strength is more than enough to permanently wreck this french fry press. Try it without a potato first, to make sure everything moves without hanging up. Put some vegetable oil on pivot points and slides and work things empty until everything is running smoothly. 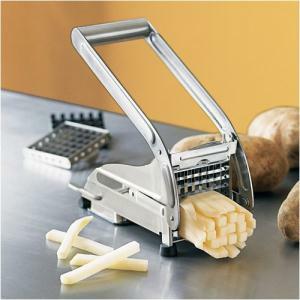 If you're careful and take extra steps like halving or even quartering potatoes before pressing them through, you may like this gadget. Just be aware that if you bend it, you break it. The cutter grid works best when it's sharp. While you could run it through a dishwasher for a quick cleaning, that's one of the faster ways to take the edge off the blades-- and once they are dull there's no option beyond a new blade. The cutters tend to glaze with starchy residue, so check them over carefully before assuming they are clean.